On this date last year, I rode my bike to High Park and snapped some great photos of the annual Sakura cherry blossoms in full bloom. Here's a taste of what I witnessed. Just yesterday, I rode to High Park to see if there were any signs of this year's peak bloom. The only signs were the literal signs they had erected the previous week. Sadly, the sign people were too optimistic. 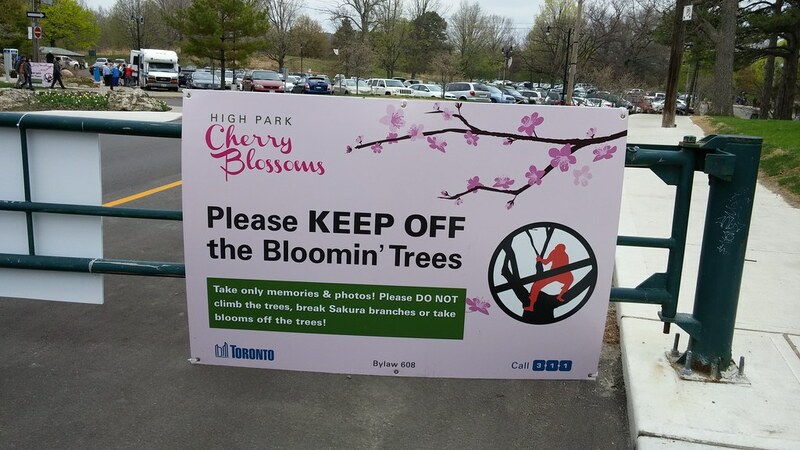 The Sakura Watch blog is reporting today that there will be no peak bloom to view in High Park in 2016. Yes I did see the first blossom today, however when I say ‘blossom’, its literally meant as in a single blossom, as in 1 lonely blossom on a tree filled with buds going to leaf. Looking throughout the park all I found was 1 tree with only 1 blossom. 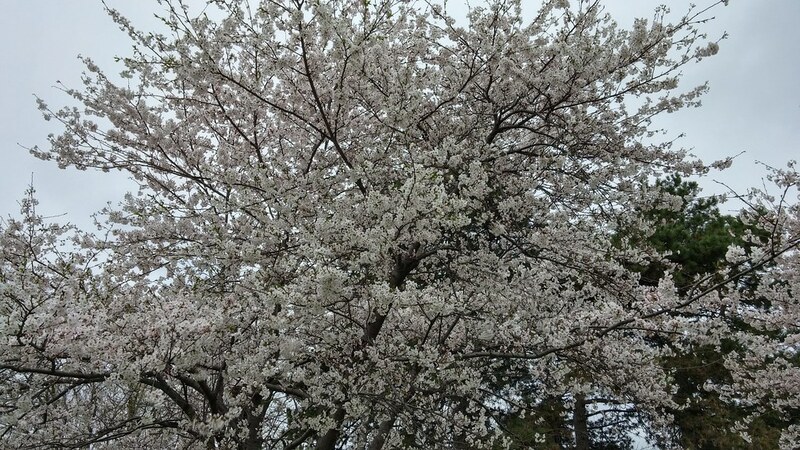 The consolation was seeing a small group of blossoms on the trunk of a nearby sakura tree. But unfortunately, every other cherry blossom tree in the park is going straight to leaf. This photo I took in 2008 will have to keep me in stead. Until next year, that is. what Bike shop would you recommend buying a bike from? Last summer, I made a pretty good deal for a Fuji hybrid at my local shop. I don't know if they're the best place in the city or anything, but I've been going there for a few years now and I like the guys who run the place. Email me if you want the name. Here's what I got for $250 below MSRP. My previous bike, bought in 2012, was a Giant hybrid from Gears and it served me very well for 13000 kms until I decided to upgrade and move to disc brakes. Mike, how long did it take to rack up 13,000 kms? How was the bike shape wise when you decided to upgrade? The KMs started racking up when I started training for the Ride to Conquer Cancer. I did that ride with the Giant. Then, I started biking 30km every weekday and in the summer, lots of weekend rides with the two older kids. What really messed up my $500 Giant hybrid was biking through winters. 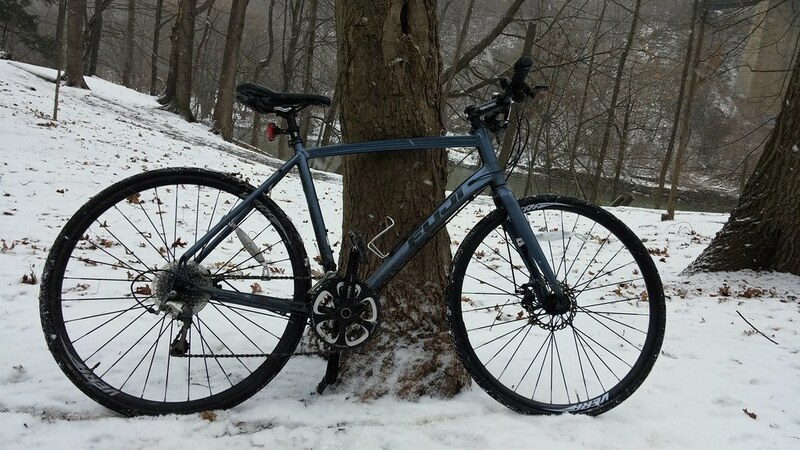 In fact, I refused to ride my new bike on snowy days this past winter. I still rode the Giant. Winter riding is great, but it does a number on the bike. This Fuji is only a few hundred dollars more, but it's a much faster and smoother ride and I adore the disc brakes. At least they're not on fire. who cares about blossoms I did not even like the tv show my marlins will win tonite I know that for shuere they will win the world series i think the Joe's auto glass team will winn in ball hockey tonight inoakvile I know they wil billy is the best player he is good and his cousins bithday is onTuesday.I am not buyingg hime a gift screw him.